You've seen - and loathed - those commercials. 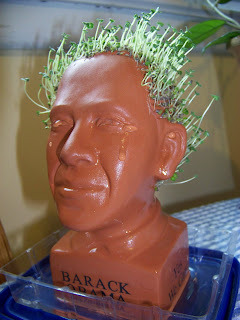 You've cracked, rightly, that the Chia Obama looks nothing like Barack Obama. And surely - though you can't quite bear to admit it to yourself or anyone else - you've wondered: if I was inclined to actually buy a few of these things, who would I give them to for Christmas? She's got the "Yes We Can" tote bag, the buttons, the t-shirt(s). She tracked down mp3s of our president's address on race, his acceptance speech, his inauguration speech, and some secretly-recorded audio of the dude joshing with reporters on a plane between campaign stops. Now she can place a ridiculously inaccurate rendering of Hope's grinning herald on her mantle, one that sprouts vegetative folicles. They like to talk to themselves, to the carpet, to the dog, to the fireplace, and to the television whenever Maury Povich or Larry King is on, and they like to imagine that those objects respond in kind, taking part in lively, round-robin conversations about which Doritos flavors rule, and which ones are totally bogus, and the plusses and minuses of exoticly-named cannibus strains. Now, because you are thoughtful and know them better than they know themselves, your stoner homies can palaver with the prez - or just convert him into a bong. Gardening's rough when you can't raise your arms above waist-level. 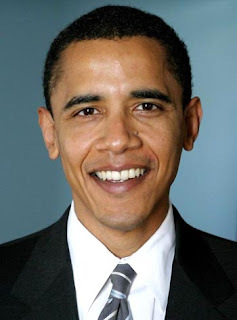 With Chia Obama - or a thousand Chia Obamas, perhaps, if you are a financially secure prankster with access to John McCain's mailing address - the 2008 Republican presidential hopeful can tend a literal plot of Hope with very little effort, while vibrating with geriatric loser's rage. 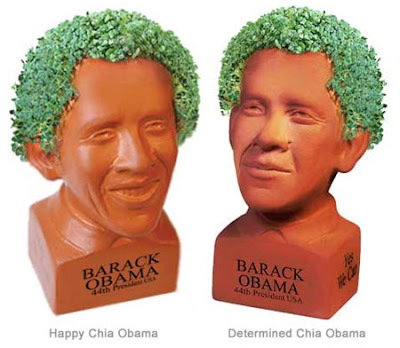 Seems like the chia Obama should be considered racist, somehow.